Whether you are a retail, institutional, or specialty pharmacy, there’s no doubt that pharmacy medication management is complicated and requires time and attention. But the payoffs for having a secure, accurate, and efficient medication management process include improved patient safety, reduced costs, and additional prescription revenue. As a leader in personalized medication automation, TabSafe combines the latest technology with input from the pharmacy community to develop solutions that help you and your patients. Additional revenue opportunities for professional services like medication reconciliation and MTM services. Containing costs, improving care coordination and improving medication management are industry imperatives. 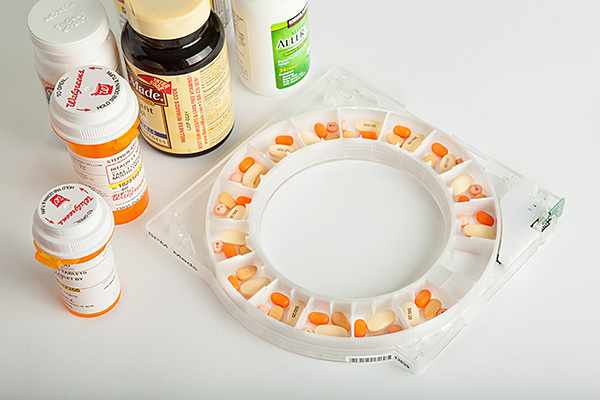 TabSafe’s personalized medication management system allows the pharmacy to provide professional pharmacy services that prevent errors, help free up caregiver time, track medication inventories, and alert the pharmacy for auto-refills. This can be done while improving patient medication adherence (>96%), controlling the use of “PRNs”, and having real-time access to patient adherence data, medication schedules and perpetual inventory. TabSafe provides personalized medication management for those people that are challenged by complex medication regimens when time-sensitive adherence and/or the documentation of patient adherence is critical. TabSafe can be programmed by pharmacies allowing for secure online access to the medication record. It can be filled by the pharmacy, caregiver, or home healthcare nurse. When TabSafe is filled by the pharmacy, it provides secure, closed-loop connectivity between the doctor, the pharmacy, and the patient (and their families) allowing real-time modifications to schedules, such as increasing, decreasing or discontinuing a medication real-time. Medication nonadherence is a serious problem that impacts healthcare costs, patient care, and patient outcomes. Misuse, underuse, and accidental overuse of medications are patient safety issues that result in the use of more costly healthcare resources. One third of all prescriptions are not filled or picked up (“Primary Noncompliance”). Less than half are being refilled within six months of the first prescription regardless of drug class (“Non-persistence”). If the prescription is filled, more than half of all prescriptions are not taken by patients as prescribed (“Nonadherence”). This results in poor care and lost pharmacy revenue.